Extend your hours, extend your geographic reach, or update old pneumatic drive-up islands with the latest in technology. QSI will provide you with a custom ROI to help determine the best solution for your institution. 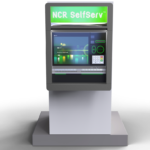 NCR Interactive Teller allows customers to choose either self-service at the ITM or to interact with a centrally located teller in a highly personalized video/audio experience. The teller remotely drives the ATM modules, providing teller service wherever and whenever you wish to offer it to your customers.